Shown with optional DualBRIDGE, Tilt-A-Jet, and A-Jet accessories. 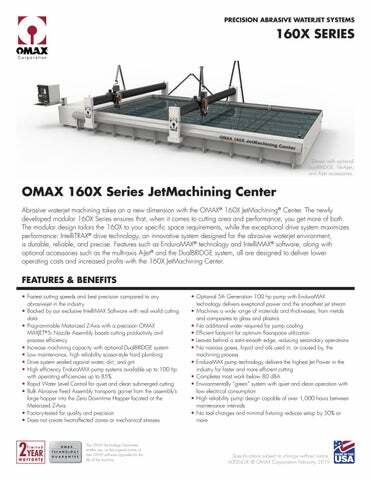 OMAX 160X Series JetMachining Center Abrasive waterjet machining takes on a new dimension with the OMAX® 160X JetMachining® Center. The newly developed modular 160X Series ensures that, when it comes to cutting area and performance, you get more of both. The modular design tailors the 160X to your specific space requirements, while the exceptional drive system maximizes performance: IntelliTRAX® drive technology, an innovative system designed for the abrasive waterjet environment, is durable, reliable, and precise. Features such as EnduroMAX® technology and IntelliMAX® software, along with optional accessories such as the multi-axis A-Jet® and the DualBRIDGE system, all are designed to deliver lower operating costs and increased profits with the 160X JetMachining Center. The OMAX Technology Guarantee entitles you, as the original owner, to free OMAX software upgrades for the life of the machine. *Optional accessories may reduce cutting travel. Photos may show optional accessories. 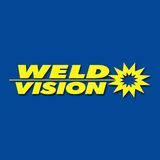 For a complete list of accessories, contact an OMAX sales representative. Accuracy specifications are at 72° F (22° C) Pumps are built to meet UL and CE specifications. Contact OMAX for detailed utility requirements. ABOUT OMAX OMAX is the global total solutions provider in advanced abrasive waterjet systems. Our intuitive IntelliMAX Software Suite simplifies programming and reduces setup times, increasing your productivity. OMAX engineers continue to innovate technology for abrasive waterjet machining, from proven 5th generation pump designs to cutting edge drive systems with micron-level accuracy. With the largest abrasive waterjet support network in the world, OMAX continues to shape the future of waterjets. To see how an OMAX JetMachining Center can save you time and money, call or visit our website and request a free part analysis today.